This is to the ones who see different... the restless youth... the seasoned adult... the achiever who exceeds heights unknown... the dreamer who dreams sights unseen. Though they may see the world differently than others, they share the same qualities to create and build a better world around them. We provide tools so they can fully realize these qualities. Their greatest barrier is not how they see things, but how others perceive them as being limited. But where some may see limitation, we see potential. Because if more see individuals with blindness differently, we can see the difference they make in our community… in our state… in our world. Vision simulator glasses give a general idea of what some visual impairments look like. 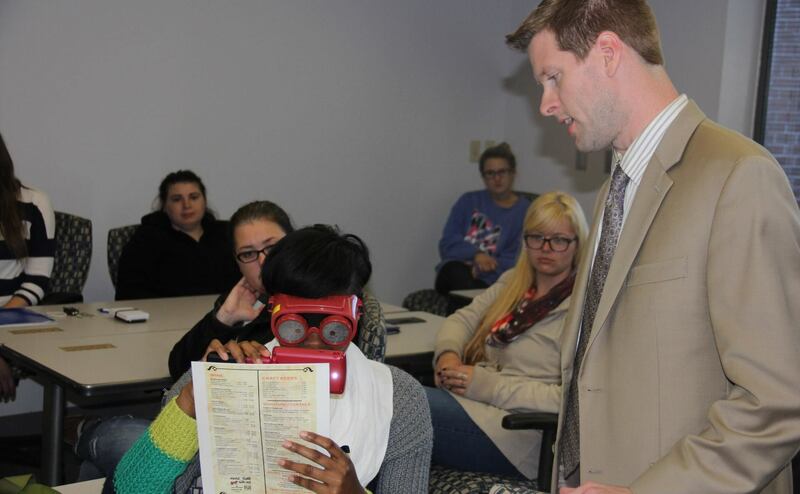 Here a "See Different" attendee looks through a pair of vision simulator glasses while using a magnifying aide to try and read regular size print. Although everyone's visual impairment is somewhat different, this demonstration gives a general idea of the challenges low vision people face each day in a world designed for sighted people. "See Different" attendee using vision simulator glasses and a hand held magnifying aid. From matching the color of clothes to pouring themselves a glass of milk, sighted people depend upon their vision a hundred times a day to do little things that most people take for granted. When you are blind, however, you must learn to do some things differently. 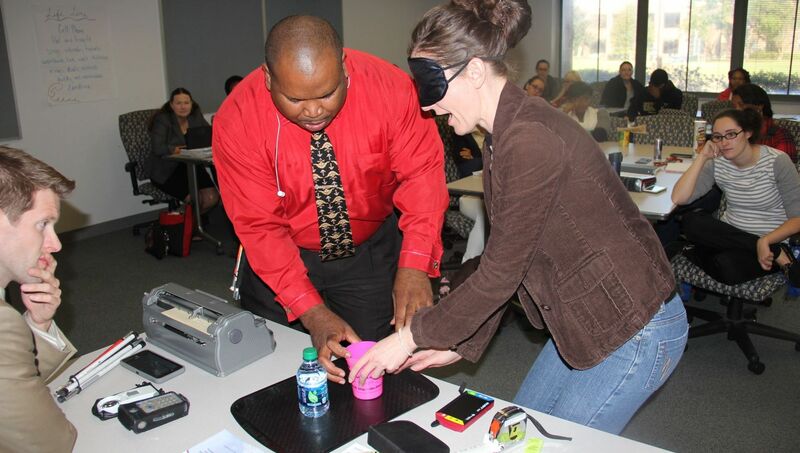 Here Walter Blackmon shows a "See Different" attendee how a blind person pours liquid without overflowing the glass. Walter Blackmon shows a "See Different" attendee how a blind person pours liquid without overflowing the glass.